SOLAR HOUSE: The Mathema household is fully solar with a 200W photo-voltaic array on the roof, a solar water heater and a parabolic reflector for boiling water. Necessity is the mother of invention, they say. Sure enough with the prospect of at least six more years of power cuts, businesses, homes and offices in Nepal are all migrating to solar power in a big way. Going solar isn't going to make you more environmentally friendly in Nepal because hydroelectricity already accounts for 99 per cent of supply. But if you use diesel gensets to tide over long loadshedding hours, then it does make sense to use the abundant free energy from the sun. Solar comes in two types: passive solar heating of water for the household, and electricity generation through photo-voltaic panels. 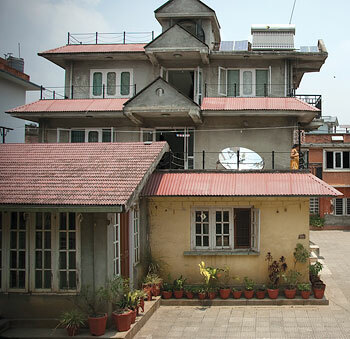 Nepal's urban homes and trek lodges routes have been using locally built solar water heaters for 30 years now. But solar cells for electricity are becoming more popular with the price of photo-voltaics coming down. The International Centre for Integrated Mountain Development (ICIMOD) has set an example by installing a solar array for backup power and to charge its fleet of electric vehicles. In winter, solar energy contributes 15 per cent of the energy needed to heat the building and also powers the perimeter and parking lot lights. Across Patan, the World Food Programme (WFP) office recently completed the first phase conversion of its entire office to solar power, even when there is electricity from the mains. "Our annual electricity bill is $20,000, and we spend $12,000 on diesel," explains WFP's Tyler McMahon. "We hope to cut the utility bills by half once the whole system is in place and will completely eliminate the diesel bill for the generator." It's not just big international organisations that are going solar. Electronic engineer Surendra Mathema has put his technical knowledge to good use at home where he has a fully solar 200W backup for the whole house, a passive solar water heating system and even a parabolic solar dish for heating water. Mathema also uses LED lights to reduce energy consumption and CFLs wherever he can. "The great thing about solar is that it's a one-time investment, once you set it up everything is free," he says. The next challenge is to convince NEA to buy back power when home generators like Mathema or organisations like ICIMOD have a surplus. This 'making the meter run backward' technology would not just turn households into power supply sources, but also help reduce loadshedding on the grid. The only obstacle is to introduce the technology and set up the regulatory framework. The time and money invested by Nepal's solar pioneers show much promise, and finally proves there may be a light at the end of the tunnel after all. 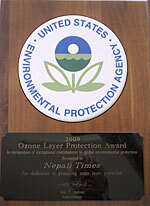 Congratulation Nepali Times for bagging the prestigious Environmental Protection Agency Award 2009.Many Happy Returns . Also for high-lighting the progress Nepal is making on the use of Biogas, Solar Photo-voltaic, Electric car use,and other environmental uses ,river polutionetc. Now is time to take up the issue of WIND FARMING. We have abundant wind;start Pilot Projects. Also we have heavy rainfalls ,but no drinking water. So go for anoter area RECHARGE GROUND WATER in Kathmandu. Start with Pilot Project. Overall solar power costs significantly more than diesel gensets or hybrid systems. This simple fact is not mentioned in the article. There may be some point to ICIMOD "setting an example" since solar could be important in mountain regions - at least as part of hybrid systems to reduce fuel costs (while still needing a diesel generator). WFP and Nepali Times promoting solar for use in urban areas like Kathmandu is a disgraceful waste of limited resources compared with diesel gensets. NEA buying back power generated by expensive solar installations is completely absurd. NEA should build emergency large thermal power stations (which are much cheaper than diesel gensets) as a stop gap until big hydro projects can be constructed. The next cheapest alternative is importing from thermal power stations India (adds transmission costs). Individual power generation is ALWAYS much more expensive than grid power, and solar is the most expensive form of individual power generation. This kind of NGO promoted "award winning" stupidity is what Nepal is famous for. So sure of ourselves, aren't we Arthur? We are not looking for cheaper alternatives, we are looking for alternatives. Solar power is better than no power. Importing thermal power from India? Give me a break. The only reason we are ven talking solar is because our netas have bungled compeltely on hydro. "But if you use diesel gensets to tide over long loadshedding hours, then it does make sense to use the abundant free energy from the sun." So the article is talking about alternatives to diesel gensets, not just alternatives to "no power". Yes I am quite sure of myself on this point. An article that claims it makes sense to use solar as an alternative to diesel ought to mention that solar is significantly more expensive than diesel instead of creating a misleading impression by words like "free energy from the sun". Why should I not be sure about this? "Thermal power" refers mainly to traditional coal fueled power plants which India does rely on and does export electricity from to Nepal. "Give me a break" is not an argument. You need to explain why the temporary solution to load shedding should not be to build thermal power plants or import from India given the delay in hydro. Both those options take less time to start delivering power than a big hydro construction project and so can be used to reduce load shedding during the delay. Both those options, like any form of grid power, are dramatically cheaper than highly expensive individual solar power. Why isn't it "award winning stupidity" to advocate that NEA pay to buy back expensive solar power from individuals instead of buying cheaper power from India or from quickly building emergency coal power stations?